Normandy Beach, Berkeley Marine Basin, 1923. Francis I. Bennett. Oil on canvas, 20 x 24. 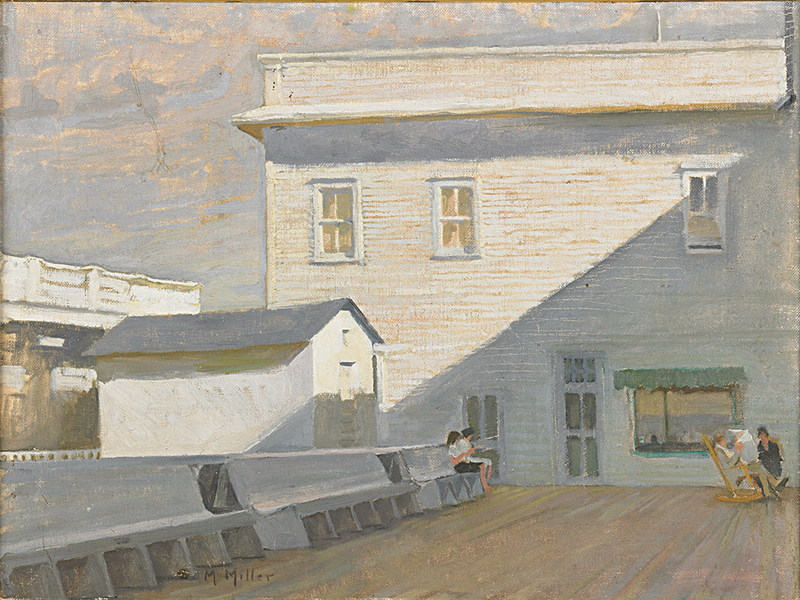 Pavilion Cape May, c. 1935. Mildred Miller. Oil on canvas, 12 x 16. Jersey Shore Impressionists breaks new ground in the history of American art by recognizing the distinct influence of New Jersey and its Shore on impressionist era American painters. This book establishes  for the first time  a category of impressionist American painters who focused on, or were profoundly influenced by, the landscapes and seascapes of this Shore  from Sandy Hook and Highlands to the Barnegat Bay region to Cape May. 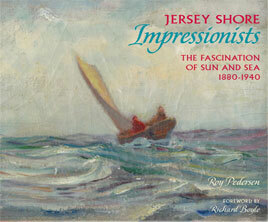 Jersey Shore Impressionists is produced in conjunction with a 2013 exhibition at the Morven Museum & Garden in Princeton, NJ. 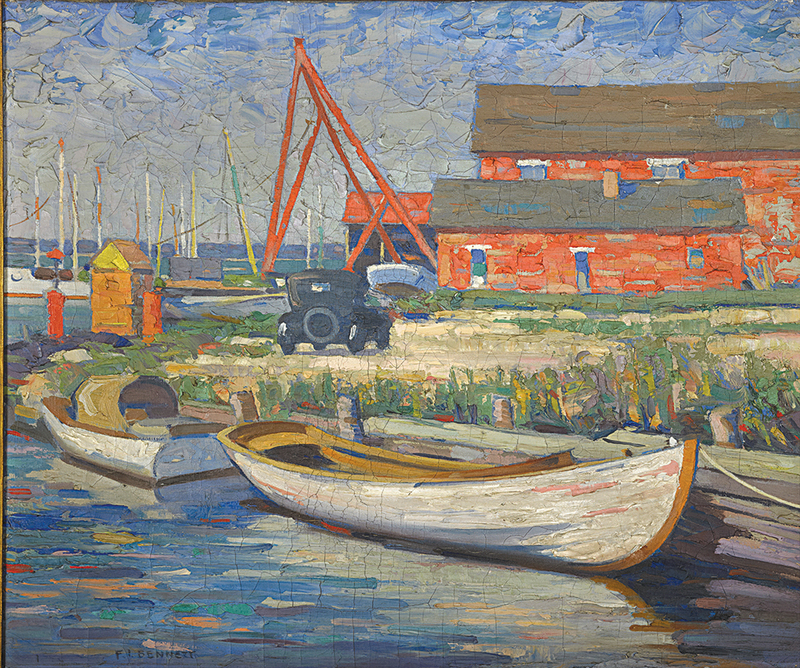 The exhibition, titled “Coastal Impressions: Painters of the Jersey Shore, 1880-1940” seeks to examine how the New Jersey shore was home to artist colonies whose output rivaled that of the better-known colonies of Old Lyme and Cos Cob, Connecticut, and Bucks County, Pennsylvania. The first art colony  at Manasquan  forms around 1880 as young artists fresh from European training in Germany, France and Italy begin to arrive, and the book includes work from these artists  Will Hicok Low, Theodore Robinson, Albert Grantley Reinhart, Charles Freeman and Caroline Coventry Haynes. The next generation  Edward Boulton, Ida Wells Stroud, Julius Golz  trained in America, join and form new colonies to paint the unique light as well as the activities of the Shore. The passionate work created by these artists stands as an important, but unsung, chapter of American Impressionism and is celebrated in this book, establishing the important contribution to American art in general, and New Jersey’s cultural heritage in particular. Roy Pedersen is an art dealer in Lambertville, New Jersey, specializing in American Fine and Decorative Arts, has lectured and written on the topics of modern painting, American Pictorialist photography, the history of American frame making, color wood block prints, and the furniture of the Arts and Crafts movement. He has been featured in public television documentaries about the New Hope art colony, and in recent years has focused on the history of New Jersey painting.